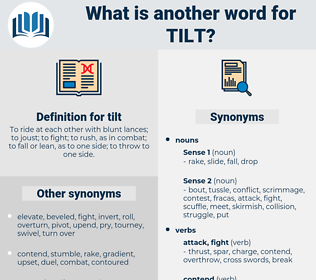 What is another word for tilt? To ride at each other with blunt lances; to joust; to fight; to rush, as in combat; to fall or lean, as to one side; to throw to one side. kneeling, inclination, incline, tip, Tipping, steepness, orientation, pitch, changeover, penchant, elevation, recline. calm, harmony, accord, peace, retreat. ascent, increase, agreement, rise, surrender. I think they are in the tilt yard with Warbel. And something had crept into the girl's voice which caused the man to lean forward, and very gently to tilt Jill's face upward so that the moon struck down full upon it.